My youngest son love old school games, music, and movies. We have so much in common. Last week he asked me if I could order some board games. The games that my son asked for were Jenga, Connect 4, and Trouble. I ordered the games online quickly. 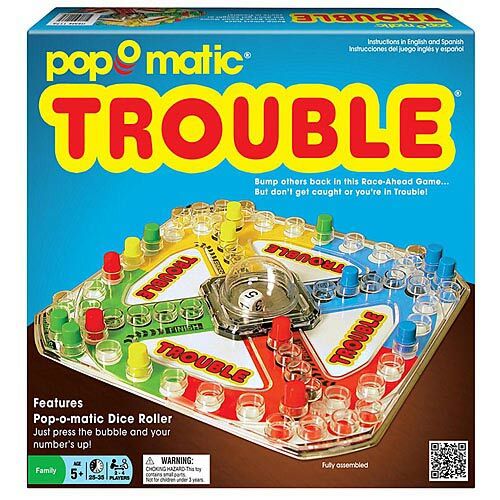 As soon as the games came in the mail, he, my niece, and I began to play the game Trouble. Anyone who knows the rules of the game of Trouble knows that you can’t get out of home base until you get a six. My son got a six and another six. I got a six too. My niece still had not gotten a six and all four of her pieces were sitting at home. My niece didn’t stop until she got a six. She didn’t get frustrated at all. This put me in the mindset about God’s timing, little things gets me to do that. We can’t get caught up looking around at other people’s turns. We have to stay focused on what God has for us once it’s time for us to step out on our journey. Anywho, my niece kept popping that bubble until she came out of home base. Like how the turtle beat the hare she won the game too! Our timing isn’t important only God’s timing is important. God does things on His time and His timing is perfect. So when thoughts of doubt attempt to enter into your mind give them trouble and keep popping that bubble.